Hop across the road to fish or explore the shoreline from this well equipped home away from home. Alternatively stretch out on the couch with a glass of wine and indulge in the breathtaking seascape and dramatic golden sand mountains . You may spot Orca whales, see gulls diving on schools of fish or watch the Waka Ama / Outrigger Canoe 'teams practising in the harbour. Use the telescope to spot the famous Maori Pou (totem) who guards the harbour! If you tire of watching sea and sands, walk along the beach ten minutes to the waterfront Opononi Hotel and wharf. Have a beer with the local characters then dinner at the Thai restaurant - best food in the north! If you prefer to cook at home, organic herbs and salad greens are in the garden. This comfortable retro house has an interesting history - built by one of NZ's All Blacks in the 1940's; Peter Smith.. The open plan house is spacious and exceptionally warm and sunny. Bedrooms are large and bathroom has shower and bath with separate toilet. A large deck with outdoor dining facility overlooks the harbour and there is a small sheltered deck at the rear with morning tea table and BBQ. # Cross the harbour by water taxi and go sliding down the dunes. $25.00 p.p. boat /sand board. # Visit the ancient kauri tree giants by day or the glow worms by night. # Follow the Hokianga artisan trail, check out Toi Box at Opononi , No 1 Gallery at Rawene and Village Arts at Kohukohu. # Soak in the healing natural waters of Ngawha Springs 40 minutes away. But wait.. there's more. For those wanting adventure, cross the harbour on the Rawene Ferry and step back in time. Visit historical Kohukohu or head west into the maori world. Check out wild Mitimiti beach, the magical Warawara mountains, Motuti Marae or tramp the Golden Stairway to Pawarenga. Come and explore this isolated and unique natural environment. Prices quoted are to bring own linen/towels/pillowcases. We supply dry pantry goods, (BYO wine and coffee! ), t. towels, bathmats,cleaning products, toilet paper. Beds for 5. Full size couch for extra person / small foam mattress or camp stretcher. We prefer people to leave house clean but there is an optional cleaning service available. Smoking allowed outside only . BYO mobile broadband. No on site WFI. See attached document 'About Opononi Seashore" for history and background. Our Opononi Seashore house has a unique history and oozes comfort, good vibes and a sense of belonging. 20 metres from the beach, with a million dollar view. Separate toilet, shower and full size bath tub. Toilet Paper is supplied BYO Toiletries - Soap / Shampoo is NOT supplied. Bathmat and towels supplied. If you choose to bring your own linen and towels this reduces the laundry fee by $30.00 per stay. Please advise when booking whether or not you would like to bring your own so the quote can be manually adjusted. Spectacular view across harbour to ever changing sand dunes and harbour heads. Opononi beach and shoreline is directly across the road with excellent swimming at high tide. - No rips directly in front of the house. Optional towels.. Included in laundry charge. Please advise if you prefer to bring your own and not pay laundry charge. Baby Gate useful for keeping dogs on deck. Electric elements..Remove stainless steel element covers before use. Dolce Gusto Coffee Maker. BYO capsules. Basic pantry items: salt , sugar, tea, instant coffee only, oil, vinegar, spices, flour, oats. Well equipped kitchen Cleaning products and dishwash liquid supplied. Four person and six person dining areas. Steep steps leading up to house. Great view, quite dated but charming and comfortable. Peaceful and relaxing. Amazing view from the lounge area and bedroom. Great area on the deck to eat outside and alternative patio out the back if it gets too warm. Nice to have access to a veg and fruit garden. Bathroom and kitchen could do with updating but the place had everything we needed and was comfortable. We didn't move the furniture as requested to avoid scratching the nice floor in the lounge but if there's more than 2 of you it's hard to watch TV together. We had a lovely relaxing time in the area and it was a great location to explore. Fabulous stay at Wendy's relaxed and comfortable home. Wendy's home provided all we needed which was a relaxed, comfortable place to stay. A fenced back yard made it perfect for the dog too. Great place to stay while exploring the Hokianga and close proximity to Hoki Smoki for our daily smoked fish and could pop over the road for a swim. What more could you need! A great place to stay to explore the Hokianga. Perfect spot in a charming cottage full of character. Very comfortable. Very well equipped. A home away from home. Loved your veg patch and the different spots to sit outside in or out of the sun. Thank you Wendy. Viv and Ian Bond Marlborough. We had a super relaxing time at Opononi in Wendy's house. Comfortable beds, lots of space for our family of 5, a good shower, thriving veggie and herb garden and lots of art and culture in the house to make it feel like more of a home:-) Very clean and tidy also. We enjoyed the short walk along the beach front to the little group of shops each day (4 square, cafe, fish n chip shop, etc) to get our supplies in this picturesque part of NZ. I would highly recommend this spot to all those visitors looking to unwind and relax. Top location and perfect for a traditional kiwi seaside holiday!! 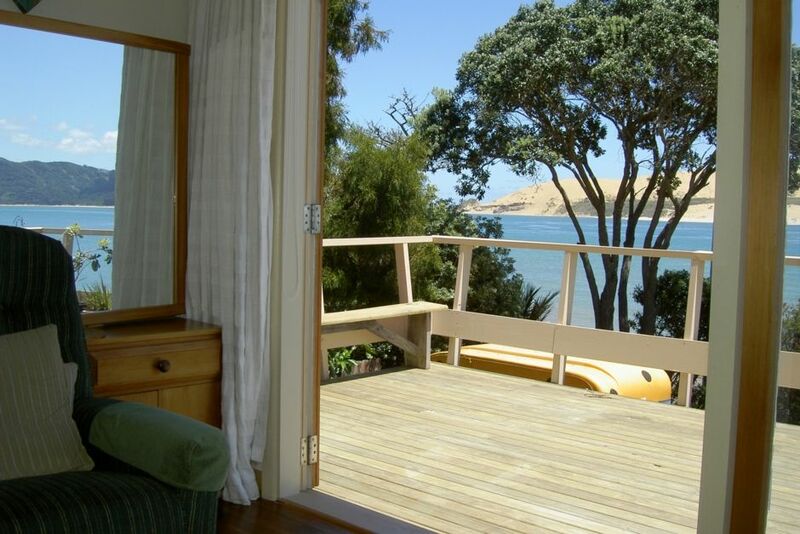 Great amenities and ‘base camp’ for a break away, or to explore the awesome Hokianga region!! Thanks Wendy!! The owners have aimed to keep the character of this older bach and its garden and it has a laid-back and quirky feel. We liked it very much. There is a big comfortable living space and good kitchen, bathroom etc. which is well supplied, including some basic food stocks. Location and view are fantastic - so beautiful and you can sit out on the deck and just enjoy. Lots of lovely places within reach too. The only issue for us (and I mention it only because it might be a problem for others) was that although the house does sleep 6, it is with a queen in one room, a double and a single bed in another, and a sofa. Our group was not quite this cosy, so we had to think laterally. But we originally had booked for 3 and then added more people, and should have asked more at the time. We had a great time and were very happy with the bach and lovely Opononi. Recommended. Area well known for high quality local arts and crafts. Check out Toi Box and No 1 Gallery. Visit historical villages of Rawene and Kohukohu. Water taxi over the harbour for sandsurfing.. $25.00pp. Drive through Waipoua Kauri Forest to see giant Kauri trees. Drive to Signal Station to walk out to view harbour heads or down to the beach to check out rock pools and rock formations. Drive to Kaikohe to soak in thermal hot springs at Ngawha.